We all know the Guyvers are immensely strong, fast and powerful. Plus they have pretty amazing awareness using the orbs in their helmets, and the ability to react very quickly(mostly referring to 2005 anime when Guyver I shot down a bullet headed for Tetsuro) which is also a skill. However that's just in one fictional universe. So what other characters have near the same attributes in American comics and other anime? For instance, one specific character has been bothering me. Goku. Now the main difference between a Guyver and a Z Fighter is that a Guyver's strength is always constant, and if they need more power, they just summon their Gigantic armor, but let's start by just focusing on a Guyver's basic form. A Z Fighter like Goku, more importantly the Saiyan race constantly improves their strength. So let's say at the start of Dragon Ball, Goku was physically weaker, slower and less powerful than a bio armor. But as Dragon Ball went on, Goku became more and more stronger, faster, powerful and aware, that even as a child, he surpassed a Guyver. My question then is what part of the manga/anime did Goku and a Guyver have the same attributes? Aside from Goku, what other characters can you think of that have the same attributes? I was just reading Spider-Man who famously has the proportionate strength of a Spider, but is he as strong as a Guyver? If not, who in the Marvel universe is? Other comic universes? If I remember Correctly, a Guyver Gigantic is 100x stronger than a Guyver, if I'm wrong, please correct me! If so, then, all of a sudden, none of the characters from before(with CONSTANT attributes) can compare. Then, who does from anime and comics with constant attributes? How about Goku in another part of his life? Let's leave Exceed out of the discussion, because one, it would be kind of weird with Exceed fighting a 6 ft tall person, and 2, I'm not fully caught up in the Guyver manga, I don't want to hear spoilers about more Exceed appearances. Thanks! The Gigantic is only supposed to be a boost of 10x, not 100x... Though the Giga-Smasher is stated to be 100x the Megasmasher. ...According to an article on Livestrong, "... the average untrained man can squat 125 pounds, bench press 135 pounds and deadlift 155 pounds." If we take this as a benchmark (sic), the Guyver should be able to heft about seven tons (metric). That means he's not quite as strong as Spider-Man. So Spider-man would be physically better, but less weaponized. The only characters I can think of that come close to the Guyver from other Comics universes are the powered armor types like Iron Man... but that is probably because the Guyver is essentially power armor anyway. And in most cases, Powered Armored heroes tend to need to stick to reality and physics for their powers, and the Guyver is in the same boat. It is still based on real data from humans, just amplified/boosted. This is why facing a human Guyver off against aliens or series that do not use reality in their equations, just doesn't fit very well very often. Strength in Guyver is really iffy. Take the infamous image of a Gregole on X-day, lifting an Abrams tank - which weighs more than 50 tons - overhead. Let's just go off that, throw caution to the wind lol. My initial guess was that Guyver in its base form could be as strong as Goku after his training with Master Roshi, and then after Korin Tower, Goku surpasses the power of a Guyver, because it seemed when he tried to fight Mercenary Tao, that was when physics went off the rails. Like I said that's just a guess, considering they can both jump high, punch through brick walls etc. Note that the only outlier would be speed, no Guyvers or zoanoids can do the after image technique or are super fast, but the Guyver does react super fast to things. 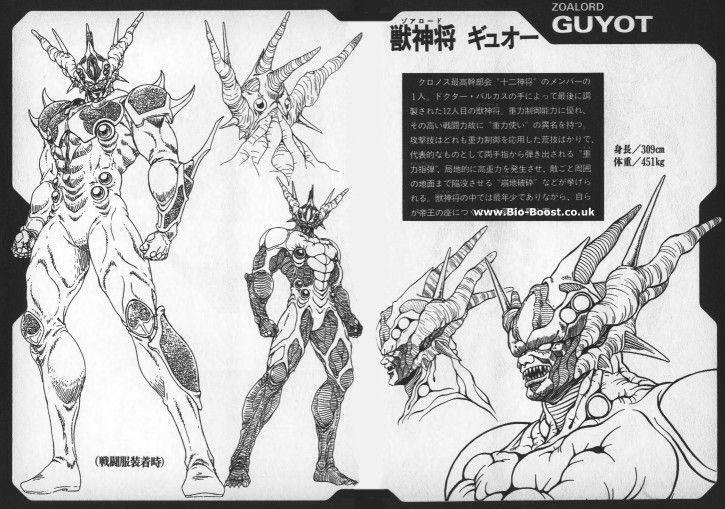 I need to know more about the Guyver's abilities In detail, to say that for sure. 7 tons sounds super weak and I would have thought Spider-Man was weaker. Again, using Dragonball is a poor source for comparison because they don't care about reality. At the time Goku completed his training with Roshi, he was already faster than most people can see. Physically they push that giant boulder, which was likely a few tons... but then can jump super high? Completely unbalanced as characters. So they might've been similar in pure physical strength at that point, but series like Dragonball rely on plot to determine how powerful someone actually is, or how much damage one can cause. So the scales are completely abnormal. Using Dragonball to compare most things is simply ludicrous in most cases. Even at its earliest forms. And sadly, so is the marvel universe. With all the retcons and depowers, new writers, plots etc... Spider-man can go from lifting a car over his head, to having trouble lifting one in the matter of 12-15 issues depending on what the story calls for. This is a big problem with the "western comics culture" and the way stories are done. A 6 foot tall being lifting 7 tons isn't super weak at all in its own world... But when you compare it to worlds with inconsistent power levels sure, it can look pretty terrible. I wouldn't over think it. The guyver isn't an all power omnipotent being if that's what you're thinking. The guyver takes on powers that deal with or are based on powers that focus on the plot and the various tropes, techniques and devices in the fictional narrative of the story. Basically, he's whatever Yoshiki Takaya needs him to be for that chapter. As you read through the manga, you'll notice that the Guyver/Sho will sometimes will be extremely super powered for a while and than he goes through a dry spell for a few chapters. Than you're going to realize that the author hasn't really given much and if you're like me..... you will probably come under the belief that the author, Yoshiki Takaya doesn't know where to take the story or how to end it. But than again does Marvel and DC really have endings? Most comic book heroes don't get one. I'd like to believe that the Guyver in his original armor is probably as physically strong as the Hulk.....and who knows in red Titan mode. plus malmot isnt at 7 tons. he is 7 times stronger than a normal person. gregole is 15 times stronger than a normal person. 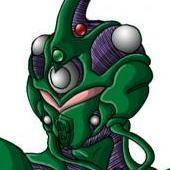 i think the data file for guyver in the vhs ova was what? 100 times a person? i honestly cant remember. guyver may of been physically weaker than gregore at first, at least he appeared to struggle for like... 10 seconds. but he has the gravity amps in the forearms and legs, that serve to anchor him and provide extra mass when making physical attacks (as i understand it). and by being anchored, he can actually exert more force than normal. I'm not a fan of these vs topics due to them not sharing the same media / author space. Simply put the worlds of Marvel / DC / Guyver were never designed to mix. Depending on who is writing it anyone of those comics in DC and Marvel's stories will not match up with what one character done in the past and like others have said here won't match up. Even with the same author all the way through as shown by others here things don't always match up with scaling (the Gregore holding a tank over its head being the classic example). Even in Guyver the live action movie vs comics is not something that works well. The Guyver doesn't go into hyperspace but is completely inside the host visually in the movies due to limited effects of the first movie. But in the second movie the activation effect looked closer to that of the comics. Don't get me wrong they are still fun to talk about but you need to take everything with a pinch of salt and not be too focused to one view. This should not be taken as a total response, it is only a theory, but I think it does not contradict anything that has been seen in the guyver manga. But here comes the problem, in the manga you have seen Gregor lifting a tank, only with his hands, in fact in the vignettes of the day you see zoanois that are more deviles than gregole lebantando automobiles. with respect to, the guyvers, maybe because they are human without processing the armor when covering them, extrapolate the maximum potential of the guests without having to process them. remember that we are talking about the maximum destruction weapons maciba created by an alien race, I do not think they were satisfied only with the regular human force. I am not convinced the manga shows a gregole lifting a tank. the drawing is crude, and I have never seen a gregole with head tails that long. there is a gregole in the foreground and his coloration is dark. the one under the tank should be even darker if it were a gregole. it is very light colored. we saw a tabross lifting a tank in the first introduction to xday. 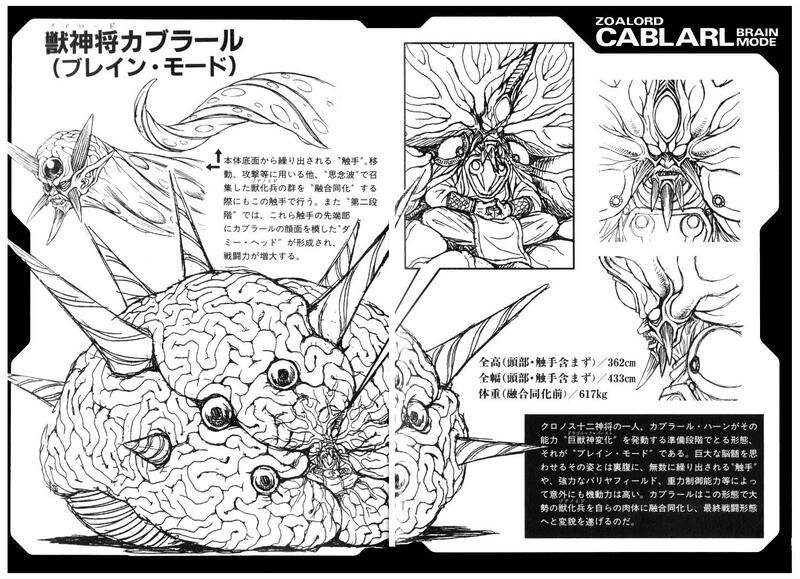 the zoanoid in the recap of xday could easily be tabross, but a crude drawing of tabross. tabross is designed to take on tanks. I don't think we had a strangth rating for tabross. he must be very strong like more stronger than darezerb. gregole is 15 stronger times than a normal person so gregole cannot lift a tank. therefore I do not believe that is gregole. it just accidentally looked like gregole for a minute. that is a tabross and shortly after the photo was took, the tabross ate the photographer for making him look shameful. Not for the first time it's painfully clear Takaya does not have a head for mass and weight: his weight number for Cabral in brain mode yields a density of about 0.019, which is about two-and-a-half times as light as styrofoam. He should really weigh 35 metric tons. This is about the most egregious example I know, but it's pretty much across the board. but if cabral weighs 35 tons in that form then he weighs 35 tons in his normal small form? I don't think that is true. why can't he have the density of 2 and a half styrofoams in brain mode? an african elephant weights over 3500 kg ( is that 35 tons?) or a hippo weights 1500 kg. I don't think that Yoshiki Takaya went into research mode and accidentally chose for cabral to weight less than an hippo if he didn't mean it. We know their mass increases as they change shape. Guyot doesn't weigh 450 kilograms when he's just a 6'4" guy. maybe he does. he held off guyver 3. he must weight a fair bit to be able to do that? Creo que eso es más probable. Sabemos que su masa aumenta a medida que cambian de forma. Guyot no pesa 450 kilogramos cuando solo es un hombre de 6'4 ". tal vez lo hace se mantuvo fuera de Guyver 3. ¿Debe pesar un poco para poder hacer eso? I wish I spoke Spanish. So much more sunny and vivid than my mothertongue - it's a comparison between Sangria and North sea water. This is why putting an exact science unto a fictional story isn't always a good thing. The art isn't a mistake it is the data file science doesn't support what Takaya had drawn and intended. In the end you've to leave the world of the Guyver to be it's own little sudo science existence where science fact and fiction mix a little. It's not just Guyver that does this, every comic / movie / story every written does the exact same thing unless it is based on historical fact. Is there any clear indication that they weight differently? Exchanging matter for energy is a possibility if it were shown. for example, do we see the surrounding environment get cold when they transform into a zoanoid? I don't think we do. I just don't see any reason why the human form does not weight the same as the zoanoid form. isn't it just an assumption? it might not be completely rock solid, but the old anime showed sho jumping down out of a tree with ease. it was reasonably high and he did it with no problem. this suggests that in guyver, a superhuman character still has abilities when they look human. murakami blocked a zoanoid when he was in human form. a normal human arm would probably have been easily broken by that blow? the zoalords are shown to be a lot more hardy even in human form so they aren't just like normal humans. it would make a lot of sense for them to have different body density. Thing is, they're still organic. And organic compounds, be they carbon- or silicon-based, just outright can't be so dense that a two-meter-tall man weighs 450 kilograms. Drawing some heat energy from the environment wouldn't cut it, either. E=MC2 means that to gain one kilogram of mass, you'd have to convert the equivalent of a 20 megaton nuclear explosive to matter. I think you'd probably cause a new Ice Age if you turned into a Zoanoid that way. why does it have to be those organic compounds? what if they made it so their bones were using more dense materials? like, I get that most cells will use normal proteins or maybe even weird ones we haven't heard of, but bones and stuff could be replaced with heavy metals? Unless those heavy metals change shape when the Zoalord transforms, the answer is 'no'. Guyot is almost one-and-a-half times as tall when he changes. Also, would those heavy metals involve his skull? Then again, his head in Zoalord form is pretty small. It's like asking, where does the extra mass come from, the bruce body when it changes to the hulk? guyver always seemed more grounded in reality though didn't it? I realise it won't be perfect, but i think it has more consistency than most marvel comics. Salkafar, I was really just hoping to suggest possibilities because I think it is easy to assume things but what if it is possible to have them weight so much when they are in human form. maybe metal in the bones can be stretched and changed easily? would it really be any different from calcium? the aliens made some pretty crazy technology, like stuff that creates a guyver with their metallic crystal structures from seemingly organic materials. I think it could be reasonable that the way zoanoids are made is rather exotic too.